Can We Truly Take A Moment For Ourselves? Last week, NPR posted an article about researchers at Harvard and the University of Virginia who asked people to sit in a room equipped with only a 9-volt battery as a shocking device and simply enough, just sit and think; have a few moments to themselves alone. Oddly, the majority of participants found themselves apt to subjecting themselves to the shock treatment. It’s not surprising, really, that so many people would subject themselves to shock treatment when left alone without any other distractions. It’s becoming less and less common for humans to take time away from technology, or anything, and simply take time to think unto themselves. Do you have a smartphone or tablet? How often do you find yourself needlessly reaching for it? Phantom ringing, or phantom vibration syndrome, is the false sense of your phone vibrating or ringing when it is not doing so at all. In 2012, it was reported that about 90% of college students find themselves susceptible to phantom ringing. 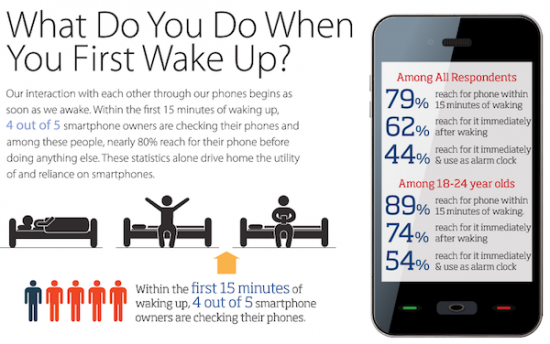 79% of smartphone users have their phone on or near them for all but two hours of their waking day; 63% keep it with them for all but one hour. A full quarter of respondents couldn’t recall a single time of the day when their phone wasn’t in the same room as them. It may be funny to look at the numbers, but to me, it’s discouraging, I am on my laptop working and trying to be productive, between school and work, for over 10 hours a day during the week-I do not feel tethered by my phone, then again, I don’t have a smartphone by choice. My friends and I will choose to go out and their faces end up illuminated by their phone’s light. I am happy to put my laptop to sleep and walk away from it, but it’s not so easy with smartphones. I read comments in response to the aforementioned NPR article and found that many users felt bogged down by their smartphones, particularly full-time workers who confided in the fact that they cannot hide from emails from their bosses and colleagues, and that they feel expected to respond to emails received on their oh-so-accessible devices. One comment was by a gentleman who recalled a girl he liked in high school. He got the courage to talk with her at length and he asked her what she thought about, she replied that she didn’t think too often because it hurt. That stuck with me; when I take time to myself without distraction, I calmly parse through my responsibilities, through my goals and necessities, to a place where I can simply be in my mind enjoying my random thoughts. Do some really experience pain on the way to, or in, this meditative state? In the Editor’s Summary of Just think: the challenges of the disengaged mind, Timothy Wilson, professor of Psychology at the University of Virginia, validated that man’s story of his old crush by saying that leaving people alone with their own thoughts “appears to be an unpleasant experience. In fact, many of the people studied, particularly the men, chose to give themselves a mild electric shock rather than be deprived of external sensory stimuli.” A lot of people confess that they find their minds wandering when they are doing seemingly arbitrary physical activities, like driving or cleaning. Are these physical stimuli necessary for the mind to feel like it can wander? Wilson and his colleagues wondered why people were willing to shock themselves-the most common answers were out of boredom and/or curiosity. When left to their own devices and making the decision to put down their smartphones and tablets in their own homes, Wilson says “they couldn’t even go for six to 12 minutes,” those results suggest that the attraction to our devices could be found in their availability, offering a window of escape when our brains lack a satiating physical stimulus. I hope that our curious and naturally innovative propensities do not become completely unmoved by the things that occur in nature, and within ourselves, that we can only observe; and that our current drives toward integration of technology into our daily lives ultimately bring us closer to ourselves without compromise, but that will take time to tell.